Taiwanese President Tsai Ing-wen speaks during a press conference in Taipei, Taiwan, on Wednesday, Jan. 2, 2019. This week, Chinese President Xi Jinping delivered a commemorative speech on the 40th anniversary of the so-called "Message to Compatriots in Taiwan,” and proposed a Taiwan model of “one country, two systems” for China’s eventual unification. 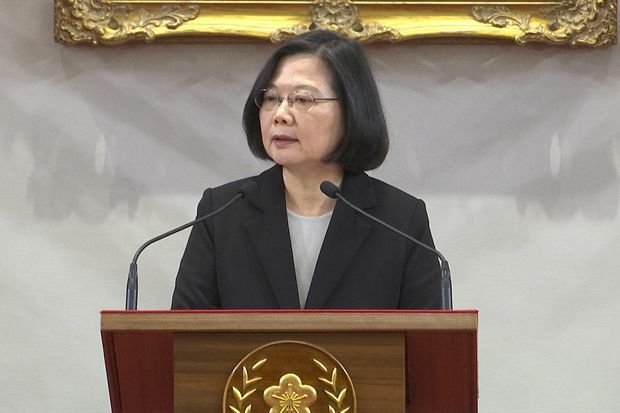 The President of Taiwan, Tsai Ing-wen, responded to Mr. Xi’s speech immediately, stressing that democratic values are the values and way of life that Taiwanese cherish. She called on China to bravely move toward democracy – for only in this way can China truly understand Taiwanese people’s ideas and commitments. In the speech, Mr. Xi said that on the basis of the “one China principle,” the two sides of the Taiwan Strait have reached the “1992 Consensus,” assuming that both sides belong to “one China” and will work together to seek “national unification." He also touted the “one country, two systems” model seen in Hong Kong as the lone path to unification. In her response, Ms. Tsai clearly emphasized that “we have never accepted the ’1992 Consensus.' The fundamental reason is because the Beijing authorities' definitions of the ’1992 Consensus' are ‘one China’ and ‘one country, two systems.’ The speech delivered by China’s leader has confirmed our misgivings.” Ms. Tsai reiterated that “Taiwan absolutely will not accept 'one country, two systems.’ The vast majority of Taiwanese also resolutely oppose ‘one country, two systems,’ and this opposition is also a ‘Taiwan consensus.’"
The people of Taiwan believe that the future of the country should be decided by its 23 million people. However, Mr. Xi in his remarks insisted that Taiwan’s only future lies in unification. The difference between the two sides is due to the very fact that democracy exists only on one side of the Taiwan Strait. This is why Ms. Tsai said that what the two sides of the Strait really need is a pragmatic understanding of the fundamental differences in the values we espouse, our lifestyles and our political systems. In addition, Mr. Xi in his speech expressed his intention to achieve unification in a peaceful manner, but he did not promise to renounce the use of force, retaining the option of taking all necessary measures. It is hard to imagine how military force can co-exist with peaceful means. Under no condition and circumstance should force be involved, whether it is in any form or against any object. Adopting a democratic and peaceful way to resolve the differences between the two sides of the Strait and to explore reality-based models for the two’s positive interactions should be the right approach that meets international norms, and is in line with Canada’s core values.